Is Donte DiVincenzo Marcus Smart 2.0? Villanova Wildcats sophomore Donte DiVincenzo has declared for the NBA Draft. 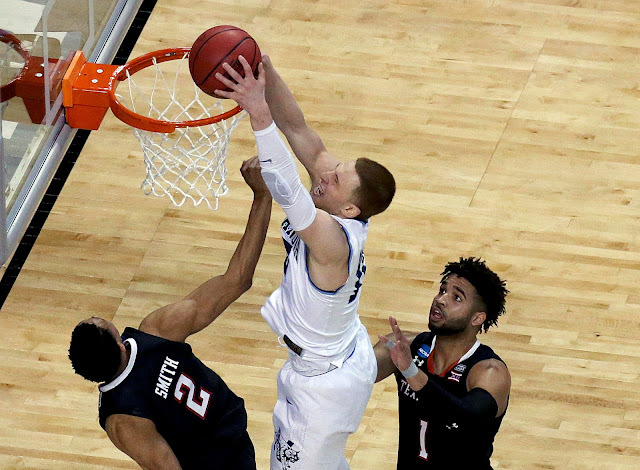 Villanova sophomore Donte DiVincenzo will remain in the 2018 NBA Draft and forgo his remaining collegiate eligibility, sources told Yahoo. The Final Four Most Outstanding Player had strong Combine, has performed well in team workouts. If you've never seen him play, well, that's a shame. Because he's got Boston Celtics written all over him. Tough. Gritty. High IQ. And just has a nose for the ball. Sound familiar? If the first person to pop into your head after reading that description was Marcus Smart you're not alone; their games are similar, except I'd have to give Donte the edge in the shooting category. While Donte's 2017-2018 numbers don't fly off the page (13.4 points, 4.8 rebounds, 3.5 assists), his full-throttle play -- on every play -- sure did. There's a loose ball -- who's the first on the ground? DiVincenzo. Down two late -- guess who's coming around a screen and calmly knocking down a triple? DiVincenzo again. While his athleticism or numbers may not awe you all the time, we as Celtics fans, thanks to having watched Marcus Smart for the last four years, know that box scores only tell part of the tale. Like Marcus, when push comes to shove, he's there to shove back -- with timely play. Like he did in the National Championship game, dropping 31 on the Michigan Wolverines en route to winning the title. 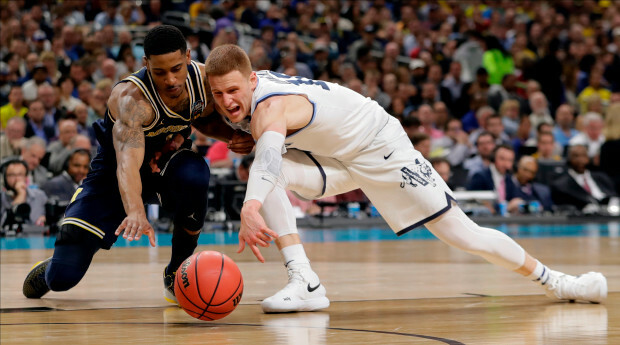 For his efforts, DiVincenzo was named Final Four Most Outstanding Player. But don't let that sweet three-ball fool you -- DiVincenzo, all 6'5" 200-pounds of him -- is also a menace on defense, hounding multiple positions with his physical, smart play. Like I said, Donte DiVincenzo has Boston Celtics written all over him. Question is, will he be available at #27 when the Celtics pick in this Summer's draft? The "worldwide leader" seems to think so, as ESPN has this "Danny Ainge type of guy" going to the Cs in their latest mock draft. Personally, after his recent showing in the NBA combine, I don't think he'll be available for us to snag come June. In a recent scrimmage, Donte netted 17 points, 13 rebounds, and 6 steals. As far as I'm concerned, he'd be the perfect complement to the current Celtics' roster. We know Head Coach Brad Stevens loves versatile players (e.g. Jaylen Brown, Jayson Tatum, Gordon Hayward, Al Horford) and, as previously mentioned, Donte can guard multiple positions. He spaces the floor well with his shooting. He's always in the right place at the right time. And he's willing to throw his body around for the sake of ending up with the ball. Come the beginning of the 2018-2019 campaign, will we be hearing "DiVincenzooooooo for threeeeeee" from Celtics' PA announcer Eddie Palladino? Who knows? With reports coming out yesterday that the Celtics have interest in trading up in the draft, this might be a moot point altogether. That said, when you factor Marcus Smart's restricted free agency status, it's easy to picture him taking Marcus' spot on the team. I, for one, am in the bring-Marcus-back camp, but if we don't and somehow end up with DiVincenzo, well, let's just say I won't be shedding any tears.